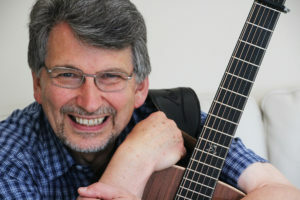 Bruce Davies, the Fife based singer songwriter will be appearing at Wighton Heritage Centre, Dundee on Saturday 23rd February from 11am to noon. With 35 years as a professional entertainer behind him, Bruce is a musician whose easy on the ear singing and storytelling have gained him many friends on four continents. Crisp acoustic guitar playing is one of his trademarks and, as BBC Celtic Roots said, “a voice in a million”. His recent album “Blowin’ In The Wind – The Other Great American Songbook” has been universally acclaimed and his Edinburgh Festival Fringe show featuring material for the album played to full houses. He spends his summers hosting and singing in “The Spirit of Scotland Show”. Throughout his career he has travelled widely, performing in prestigious venues throughout the UK and USA to a huge variety of audiences. He has recorded extensively as a musician and producer for folk legends The McCalmans, and Harvey Andrews. In a recent list of “The Hundred Greatest Cultural Fifers…Ever!”, Bruce featured alongside Ian Rankin, Dougray Scott, Val McDermid, Jack Vettriano and other Fife luminaries. He has received many plaudits but his most treasured are, from Kenny Rogers “You do great work!” and when his songwriting hero Tom Paxton introduced him as “ one of Scotland’s best singers”.